If your new year’s resolution is to find a marvelous new home in one of the Triangle’s most desirable communities, look no further than the Legacy Falls neighborhood in Legacy at Jordan Lake! 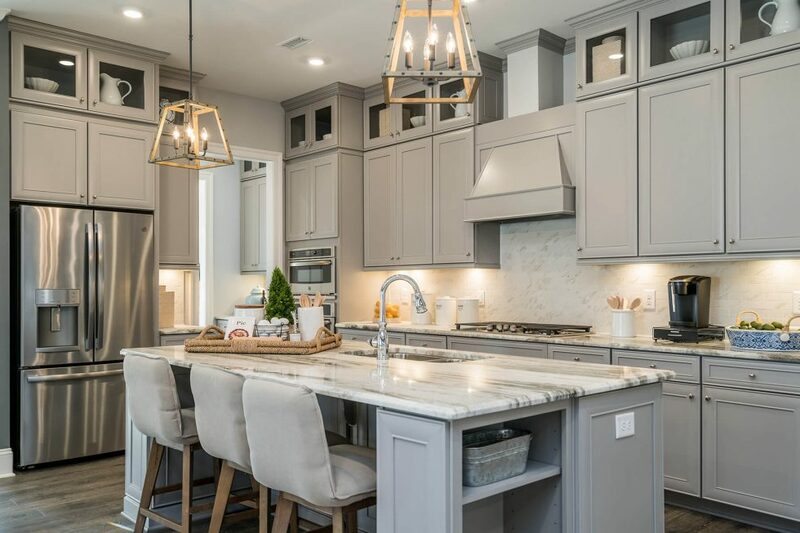 Developed by Freehold Communities, Legacy at Jordan Lake is a premier gated community of distinctive homes on 316 acres of rolling hills adjacent to picturesque Jordan Lake, just off Highway 64 in Chatham County. Trails, streams, an extensive amenities package, and lovely wooded homesites grace the property, as well as a spectacular waterfall cascading over a ledge 20+ feet in height at the community entrance. Legacy is quite simply a “must see,” offering vital and invigorating opportunities for those ready to raise a family, those ready to downsize, and those in between. *On Quick Move In Homes – Valid on inventory contracts written between January 2, 2019, and February 28, 2019, 2019, and closed by March 29, 2019, during the New Year New Home Event. Discounts vary by product, home site and per community. Anything above and beyond promotional credit is buyer responsibility. Certain additional deposits may be required depending on the options selected. The interest rate is below 3.99% with a 30-year Conventional fixed rate mortgage and a 10% down payment. The program is available on select inventory homes only. Buyer must occupy the property and meet all qualification requirements of the program. The Seller’s contribution is limited to agency limits which depend on the loan program and LTV. Payments are based on a minimum 720 credit score. Buyer must make loan application within 48 hours of contract signing and must close by March 29, 2019. Advertised rate is for a limited time and subject to change without notice. Other financing programs may be available with as little as 3.5% down. Financing is offered through M/I Financial, LLC (NLMS# 50684). **Free Appliance Package includes standard washer, dryer, refrigerator and blinds. Offer good on new contracts written on or after 1/3/19 that close no later than 3/29/19. Some restrictions apply. Contact New Home Consultant for complete details. + Smart Home Bundle – Only applicable on To-Be-Built-Homes is subject to change without notice. See New Home Consultant for details. +++M/I Homes will pay up to $3500 in allowable closing costs (excluding pre paids, HOA dues and set up fees) on new To-Be-Built contracts written on or after 1/3/19. These closings costs will be paid on primary residence and 1st mortgages only and available through M/I Financial. The buyer must make application within 24 hours of contract. Some restrictions apply. See New Home Consultant for details. Materials are protected by copyright, trademark, and other intellectual property laws. All rights in these materials are reserved. All products and company names marked as trademarked (™) or registered (®) are trademarks of their respective holders. Copying, reproduction and distribution of materials without prior written consent of Freehold Communities is strictly prohibited. All information, plans, and pricing are subject to change without notice. This information does not represent a specific offer of sale or solicitation to purchase property within Legacy at Jordan Lake.